April 27th, 2009: Sunny ,Warm and Windy, Water Temp 68* and Clear. Got out early , caught bait, picked the guys up at 5:45, caught a little more bait and went fishing. We had our spread of boards out before 6 and pulled some points up in the river. After a while we relocated to a main lake flat, ranging in depths from 15 to 30 feet deep, pulling boards and downlines. We were getting bit about every 15 minutes or so until about 11am, then the fish really turned on and the action was about all we could handle for a while, then the wind started howling and I could not control the boat well enough to fish the way I wanted to. 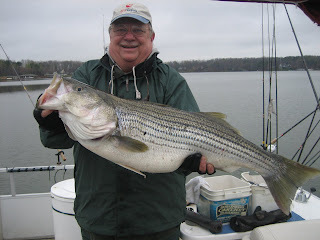 The guys caught a bunch of Stripers and some nice Catfish also. 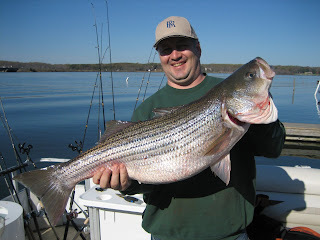 They kept 14 Stripers to take home for dinners. The warm weather has turned the fish on and made them more predictable. April 25th, 2009: Sunny and Hot, Water Temp rising to 65* and Clear. April 15th, 2009: Cloudy, Cold and Rain. Water temp dropping to 54* . Picked up Jimmy at 6am and went to catch bait. Threw for a couple hours and went fishing. Found some fish on ledges between 16 and 2o feet deep and put some baits in their faces. Fish were fairly lethargic, the baits would get nervous but the fish were reluctant to hit them. After 20 minutes of fishing we hooked up and Jimmy got a feeling for what he was in for today. We boated the fish and turned around to hit the same area. Jimmy was ready for some action and he got it. The front rod went off first, as he was fighting it another got hit, then another and another. We got 2 or 3 of those in, took pictures and released the fish. After 15 minutes without another hit I moved on knowing that when you release fish that size they alert the school and the action is over. Hit another spot and boated a few, released them and they turned off. Left to go catch more bait, threw for another 2 hours, went to another area and set up on a ledge . Same scenario as before, this time 4 rods hooked up within a 3 minute period. We boated these fish as well, one got tangled in another line, as I was untying it a fish hit the line I was holding and ripped it out of my hand, Jimmy boated it as well. Made yet another move to another ledge, boated a 8 pounder, made a turn back around and hooked up with the fish of the day. After a couple of minutes battling the fish we boated it, a nice one at 15 3/4 pounds. We released it and called it a day. We took pictures of all the fish before they were released, not enough room on the journal to show them all. April 14th, 2009: Cloudy, cold , rain and wind. Water Temp 55* and clear. Had another cancellation today so I called up Greg from Louisa Boat and Motors and we went out for a while checking out different areas to fish. Bait collection sucked but we managed. Set up on a long flat uplake pulling boards. After an hour of nothing, we got the baits in and went to catch more bait. Ran downlake and checked out a few areas with no luck. Decided to try something a little different and started catching fish. Caught fish till we ran out of bait, went and tried to catch more but with the weather the way it was and it getting late we just called it quits. Greg released all the big fish today and kept the 2 smallest ones to take home to his mother-in-law who enjoys eating fish. On the way home Greg noticed I had a blown out bearing on my trailer, he said lets take it to his shop and he replaced it. He saved me a days trip, I am sure I would have ended up along side of the road out of commission later on in the week if he had not seen and fixed the bearing. [ this is not the only time he has saved me, one morning as I was pulling out my driveway my hub fell apart, I called Greg, by 7:30 am he had got the hub, came to my house and replaced it, I was back on the water and fishing by 8] It just doesn't get any better than the Whitlock family, and I am blessed to have them as friends. April 11th, 2009: Cloudy, Rain, Wind, Water Temp 54* and Clear. Got on the water this morning and John called me, He and Tim had a light out and had some nice herring on it so I went to them and caught bait. Picked the guys up at their dock at 6:15, caught a little more bait and went fishing. I was under the gun this morning, I knew a major front was suppose to blow through about 9am and I wanted to put some fish in the boat before the fish shut down. Set up on a deep flat pulling boards and downlines. It was still calm out and fairly warm. I started off working an area Anthony caught fish on yesterday but after 15 minutes and no hits I moved on. Found a ledge loaded with cows and the action started. We had a couple of hook-ups before the guys understood what to do but once they did we started putting Hogs in the boat. I circled around 4 times over the ledge and every time we hooked up, sometimes with doubles. We lost a couple fish on the ledge and things slowed for a bit so I moved on. By 9:20 it was getting black out and the next thing I knew the wind started gusting, the rain came down, the air temp dropped 15 degrees, and the fish turned off. I had warned the guys last night that this would happen to us today, but they still wanted to go, and were glad they did. The guys kept a few fish and released the others to fight again another day. We were off the water by 10:30, the guys were cold but had big smiles on their faces. 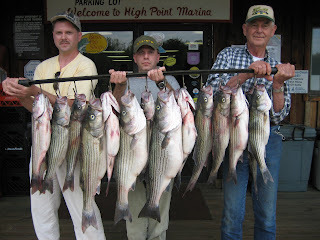 Larry is holding a 13.12 Striper caught before the front and Tim is holding a nice Striper caught just as the front started to blow through. April 8th, 2009: Partly Cloudy, Cold and Windy. A heck of a cold front blew threw yesterday and all day today, made fishing very tough. I had to throw for bait for over 3 hours just to get enough bait to go fishing. By then the wind was a steady 15 with gusts above 25. I ran the lake looking for places to get out of the wind, could not find any so I put out a few downlines and started fighting the wind. I could not run boards like I wanted to , I would have not had any control over them. We hit 2 places without a bite, I found some fish on the graph , put the trolling motor down, floored it, put 1 bait out and before I could put in the rod holder it went off. I finally got out 3 baits, they all hooked up at once. We got a couple of them in while Bob fought a hog, after a while his fish broke off. We hit a few more areas and got into fish good 1 more time but it ended up being a long, hard day. The guys were happy catching what they did today considering the conditions, I guess that is what matters most. April 5th, 2009: Sunny and Warm, Water Temp 55* and Clear. Anthony got up early this morning and went out to catch bait before picking up the guys at daylight. 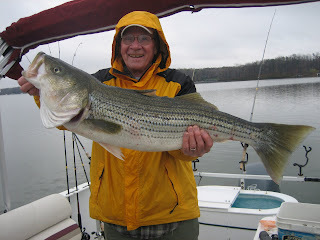 I called him about 7 and he said he could not find a place to fish, there were so many Striper and Bass boats fishing that every point where ever he looked had a boat on it. He ran down lake and set up on a flat below the 208 bridge, pulled a mile but got run over down there so he looked for a quieter place. After trying another area he realized it was futile to try to fish the way he was, changed up and before he got all his rods changed over they started getting bit . Looked over at his boat and it looked like he had opened one of his seats and got into a hornets nest, everyone was running around the boat, Bebe laughing so hard we heard him a half a mile down the lake. When Anthony caught up he hollered at us and we came over and had some fun ourselves. They caught a bunch of fish, Anthony doing a great job for such adverse conditions.